In Famous Monsters of Filmland #132 (March, 1977), an advertisement appeared for a Godzilla Fan Club. The ad was placed by a gentleman named Richard Campbell. 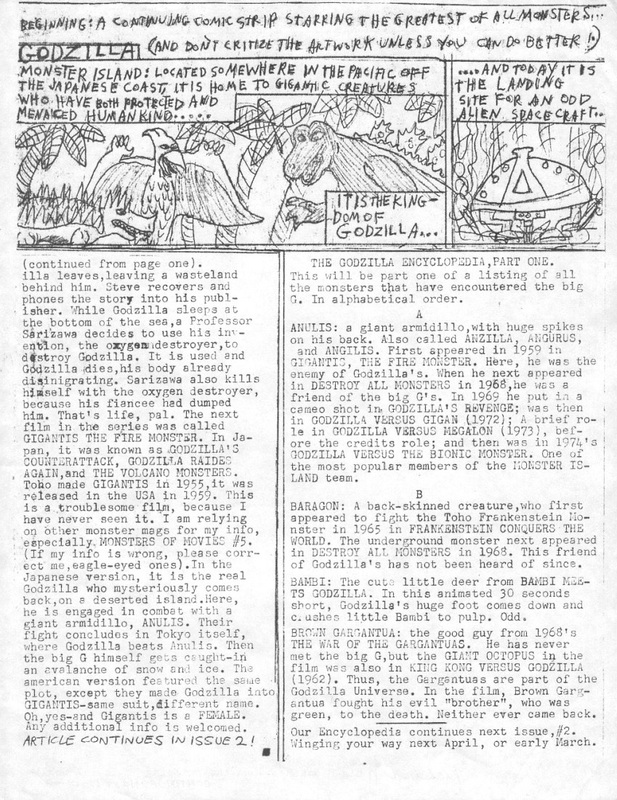 Nathan Fox, a young Godzilla nut who saw the ad and immediately subscribed, saved all five newsletters (called “fan letters”) produced by Campbell and his team. 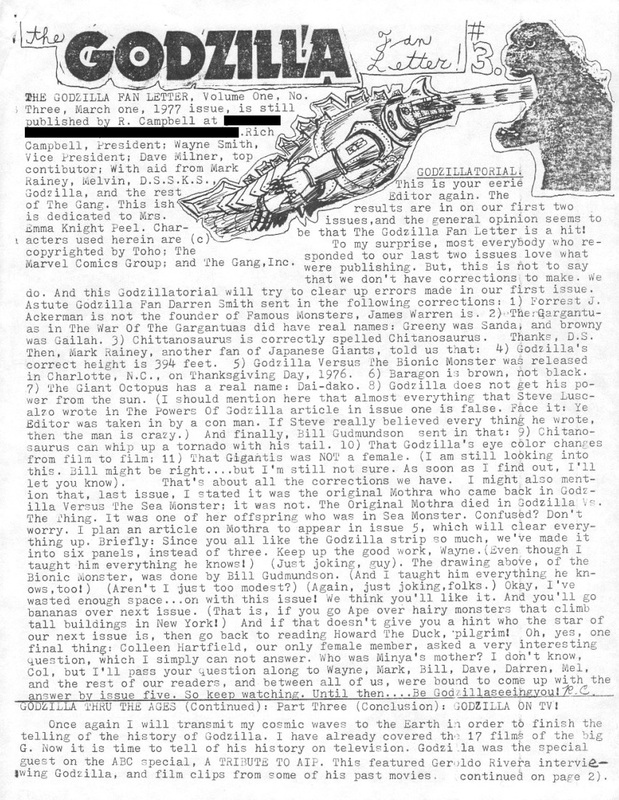 The detail I left out is that Campbell was 17 or 18 at the time he placed the ad and produced, by hand, the fan letters, all of which have been scanned by Fox in various formats. Read the amazing story and see the letters at Fox’s site. Could this have been the first American Godzilla fan club? It’s unlikely, but if there had been others in plain sight, I doubt Campbell would have placed his ad (you can see that on Fox’s site as well). As I’ve said many times before, we were a generation of fans when being a fan meant more than compulsively advertising the fact to the world. It meant building working monuments and monographs to our sources of inspiration. I would love to see that, Chris. Do you remember where you first heard about the fan club? Yep, I had one. The “Godzilla Fan Club” was promoted on both “Creature Features” and “Captain Cosmic” on KTVU-2, since I was serving as their teenaged “Godzilla/Japanese Film Expert.” The beloved host, Bob Wilkins, set it up for me and we ran with it. We did have two different fan club kits, which each included a newsletter, but the untimely death of my mother put a damper on any bigger plans we may have had. We did host at least one movie screening of GODZILLA ON MONSTER ISLAND at the Fruitvale Playhouse in Oakland, CA. I still have a box of both fan club kits in storage. 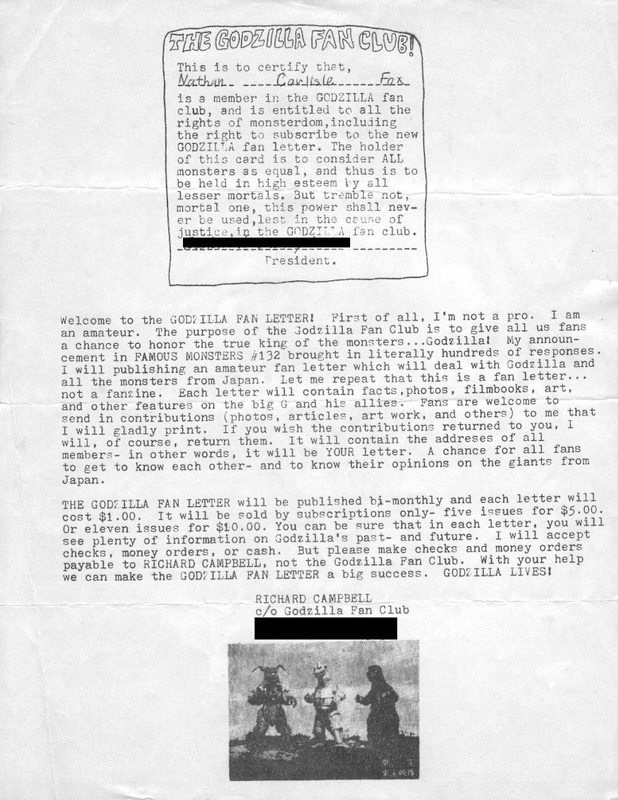 The first kit was printed in blue and included a fan club member’s certificate (with artwork by Dennis Lancaster), a newsletter with a cut-out membership card, and a photo of Godzilla. The second wave included a new certificate (with all new artwork by Lancaster), a new newsletter and new cut-out membership card, and a new photo of Godzilla. I just had a chance to watch the video. First, you are pretty damn collected in front of the camera, especially at that age. Second, I miss shows like this so much (along with the movies and shows they highlighted). Third, I would love to post your fan club stuff. It looks brilliant. Cheers and thanks! By the time this was shot, I was pretty much a veteran of the show (appearing about two dozen times) as well as multiple appearances on “Creature Features.” We’re lucky we have a similar, locally produced horror host show — and I just taped a promo with them this past weekend for my book — “Creep KOFY Movie Time.” It’s raunchier than the old shows, but it’s popular and has been on the air for about five years, now. P.S. I was born and raised in San Francisco, California. And KTVU-2 was our biggest independent television station, based across the bay in Oakland. Ironically, I’m currently a contributing editor and columnist at “Famous Monsters” magazine, and I put together our popular annual “Kaiju Issue.” Also, I’m the author of the official, heavily-illustrated biography on the man who brought Godzilla and Ultraman to life, “Eiji Tsuburaya: Master of Monsters” (Chronicle Books). The new, paperback edition drops on May 6, 2014. August, I’m so thrilled that you stopped by. I’m running a kaiju Q&A tomorrow, for “curious beginners and lapsed fans,” and your book and blog are listed as suggestions for further reading. Mikey Walters, who worked with me on the article, is going to be thrilled as well. He’s a big fan, and my go-to guy on all things kaiju! You’re welcome and thanks for the kind gesture! Remember, the first edition of my book is long gone, and copies go for hundreds of dollars, while the new, paperback edition — nearly identical, physically, to the hardcover version, except for the hardcover — is going for $29.95 (and even cheaper on Amazon)! We were able to go in and correct some editorial gaffes — and some continuity problems that bled through the editing process — in this new edition. I also discovered that my passage on DOGORA, THE SPACE MONSTER (1964) was missing, and so it’s reinstated in the new edition as well. Break a leg with the Kaiju Q&A tomorrow! I’m extremely excited to read these comments from my kaiju scholar idol! I’m proud to own the first edition of Master of Monsters and enjoyed the last kaiju issue of Famous Monsters as well. Cheers, Mike! And thanks — it’s really appreciated! Thanks for remembering me, guys. I remember August did an article about Japanese TV super heroes that I printed in either GODZILLAMANIA 6 or 7. He’s a great guy. Anyway, thanks again, nice to be remembered! Best. Richard Campbell. Do you have any physical copies of your zines? And do you remember the Japanese newspaper article about “Godzilla vs. The Devil” that was published in “Godzillamania”, I believe? Loved those ‘zines back then, because while we had our opinions, no one was nasty or mean, because we all loved these movies.